Gestalt psychology or gestaltism (German: Gestalt – "essence or shape of an entity's complete form") is a theory of mind and brain of the Berlin School; the operational principle of gestalt psychology is that the brain is holistic, parallel, and analog, with self-organizing tendencies. The principle maintains that the human eye sees objects in their entirety before perceiving their individual parts, suggesting the whole is greater than the sum of its parts. Gestalt psychology tries to understand the laws of our ability to acquire and maintain stable percepts in a noisy world. Gestalt psychologists stipulate that perception is the product of complex interactions among various stimuli. Contrary to the behaviorist approach to understanding the elements of cognitive processes, gestalt psychologists sought to understand their organization (Carlson and Heth, 2010). The gestalt effect is the form-generating capability of our senses, particularly with respect to the visual recognition of figures and whole forms instead of just a collection of simple lines and curves. In psychology, gestaltism is often opposed to structuralism. The phrase "The whole is greater than the sum of the parts" is often used when explaining gestalt theory, though this is a mistranslation of Kurt Koffka's original phrase, "The whole is other than the sum of the parts". Gestalt theory allows for the breakup of elements from the whole situation into what it really is. The investigations developed at the beginning of the 20th century, based on traditional scientific methodology, divided the object of study into a set of elements that could be analyzed separately with the objective of reducing the complexity of this object. Contrary to this methodology, the school of gestalt practiced a series of theoretical and methodological principles that attempted to redefine the approach to psychological research. Phenomenon experimental analysis—In relation to the Totality Principle any psychological research should take as a starting point phenomena and not be solely focused on sensory qualities. Emergence is the process of complex pattern formation from simpler rules. It is demonstrated by the perception of the dog picture, which depicts a Dalmatian dog sniffing the ground in the shade of overhanging trees. The dog is not recognized by first identifying its parts (feet, ears, nose, tail, etc. ), and then inferring the dog from those component parts. Instead, the dog is perceived as a whole, all at once. However, this is a description of what occurs in vision and not an explanation. Gestalt theory does not explain how the percept of a dog emerges. Multistability (or multistable perception) is the tendency of ambiguous perceptual experiences to pop back and forth unstably between two or more alternative interpretations. This is seen for example in the Necker cube, and in Rubin's Figure/Vase illusion shown here. Other examples include the Three-legged blivet and artist M. C. Escher's artwork and the appearance of flashing marquee lights moving first one direction and then suddenly the other. Again, gestalt does not explain how images appear multistable, only that they do. Invariance is the property of perception whereby simple geometrical objects are recognized independent of rotation, translation, and scale; as well as several other variations such as elastic deformations, different lighting, and different component features. For example, the objects in A in the figure are all immediately recognized as the same basic shape, which are immediately distinguishable from the forms in B. They are even recognized despite perspective and elastic deformations as in C, and when depicted using different graphic elements as in D. Computational theories of vision, such as those by David Marr, have had more success in explaining how objects are classified. A major aspect of Gestalt psychology is that it implies that the mind understands external stimuli as whole rather than the sum of their parts. The wholes are structured and organized using grouping laws. The various laws are called laws orprinciples, depending on the paper where they appear—but for simplicity sake, this article uses the term laws. These laws deal with the sensory modality vision however there are analogous laws for other sensory modalities including auditory, tactile, gustatory and olfactory (Bregman – GP). 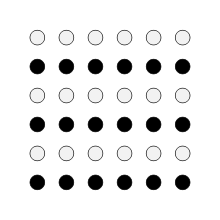 The visual Gestalt principles of grouping were introduced in Wertheimer (1923). Through the 1930s and '40s Wertheimer, Kohler and Koffka formulated many of the laws of grouping through the study of visual perception. Law of Proximity—The law of proximity states that when an individual perceives an assortment of objects they perceive objects that are close to each other as forming a group. For example, in the figure that illustrates the Law of proximity, there are 72 circles, but we perceive the collection of circles in groups. Specifically, we perceive there is a group of 36 circles on the left side of the image, and three groups of 12 circles on the right side of the image. This law is often used in advertising logos to emphasize which aspects of events are associated. Law of Similarity—The law of similarity states that elements within an assortment of objects are perceptually grouped together if they are similar to each other. This similarity can occur in the form of shape, colour, shading or other qualities. For example, the figure illustrating the law of similarity portrays 36 circles all equal distance apart from one another forming a square. In this depiction, 18 of the circles are shaded dark and 18 of the circles are shaded light. We perceive the dark circles as grouped together, and the light circles as grouped together forming six horizontal lines within the square of circles. This perception of lines is due to the law of similarity. Law of Closure—The law of closure states that individuals perceive objects such as shapes, letters, pictures, etc., as being whole when they are not complete. Specifically, when parts of a whole picture are missing, our perception fills in the visual gap. Research shows that the reason the mind completes a regular figure that is not perceived through sensation is to increase the regularity of surrounding stimuli. For example, the figure that depicts the law of closure portrays what we perceive as a circle on the left side of the image and a rectangle on the right side of the image. However, gaps are missing from the shapes. If the law of closure did not exist, the image would depict an assortment of different lines with different lengths, rotations, and curvatures—but with the law of closure, we perceptually combine the lines into whole shapes. The gestalt laws of grouping have recently been subjected to modern methods of scientific evaluation by examining the visual cortex using cortical algorithms. 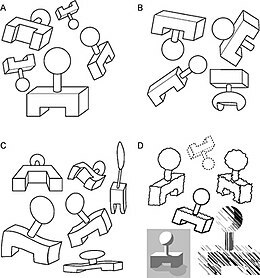 Current Gestalt psychologists have described their findings, which showed correlations between physical visual representations of objects and self-report perception as the laws of seeing.